So you didn't win the big award especially after losing to your main rival. It isn't the best feeling. In this situation, Nissan LEAF lost to the Chevy Volt for North American Car of the Year at the North American International Auto Show but that didn't stop Nissan from promoting what they did win. 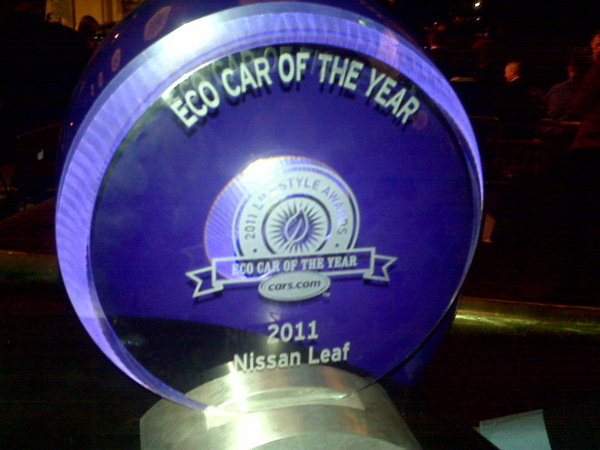 Today on Twitter there is a promoted tweet: "Nissan LEAF" that promotes their winning the Eco Car of the Year at NAIAS. There is nothing wrong with promoting this tweet and getting the word out. 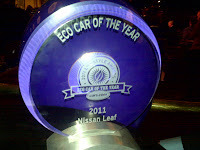 Nor is there anything wrong with the Eco Car of the Year award, I'm sure it's an honor. I just wonder if it's a little sad after losing the big award to have to promote a tweet to get people to notice you did win something. After all of the press coverage of Chevy Volt winning Car of the Year on Monday, perhaps Nissan felt a bit left out and wanted to share they didn't walkaway empty handed. Lastly, I would've never known they won if it wasn't for the promoted tweet so it definitely served its purpose. Interesting you caught this on Twitter. Could the trend of 2011 be to do even MORE self-promotion on Twitter? I get nervous over the promoted tweets from a brand standpoint. There is a very nasty underbelly on Twitter if you find the right hashtags. More so for the Ultra-Right in Politics than the left, but plenty of fight from the left as push back. Then you have the pervs and the gangstas. Does twitter have a way to prevent your Sponsored tweet being next to a racist or hatred comment? As for Nissan they should just promote their car and make it stand on its merits.